The 49th parallel north is a circle of latitude that is 49° north of Earth's equator. It crosses Europe, Asia, the Pacific Ocean, North America, and the Atlantic Ocean. Roughly 3,500 kilometres (2,175 mi) of the Canada–United States border was designated to follow the 49th parallel from British Columbia to Manitoba on the Canada side, and from Washington to Minnesota on the U.S. side, more specifically from the Strait of Georgia to the Lake of the Woods. This international border was specified in the Anglo-American Convention of 1818 and the Oregon Treaty of 1846, though survey markers placed in the 19th century cause the border to deviate from the 49th parallel by up to tens of meters. 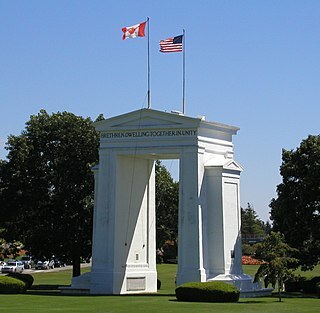 In North America, the westernmost monument on the 49th parallel is the Point Roberts Boundary Monument near the corner of Marine Drive and Roosevelt Way in the Point Roberts, Washington exclave south of Delta, British Columbia. Monument in the northern part of town centre, Prešov, Slovakia. In 1714, the Hudson's Bay Company proposed the 49th parallel as the western portion of the boundary between the company's land and French territory. At the time, Britain and France had agreed, in the Treaty of Utrecht, to negotiate a boundary, but negotiations ultimately failed. Following the Louisiana Purchase by the United States in 1803, it was generally agreed that the boundary between the new territory and British North America was along the watershed between the Missouri River and Mississippi River basins on one side and the Hudson Bay basin on the other. However, it is often difficult to precisely determine the location of a watershed in a region of level plains, such as in central North America. The British and American committees that met after the War of 1812 to resolve boundary disputes recognized there would be much animosity in surveying the watershed boundary, and agreed on a simpler border solution in the Treaty of 1818: the 49th parallel. Both sides gained and lost some territory by this convention, but the United States gained more than it lost, in particular securing title to the Red River Basin. This treaty established the boundary only between the line of longitude of the northwesternmost point of Lake of the Woods, on the east, and the Rocky Mountains, on the west. West of the Rockies, the treaty established joint occupation of the Oregon Country by both parties; east of Lake of the Woods, the boundary established in the Treaty of Paris would be retained. The 49th parallel north as a border between the Canadian provinces of British Columbia, Alberta, Saskatchewan and Manitoba (to the north), and the U.S. states of Washington, Idaho, Montana, North Dakota and Minnesota (to the south). Although parts of Vancouver Island and parts of Eastern Canada are south of the 49th parallel, and parts of the United States (Alaska, Northwest Angle) are north of it, the term 49th parallel is sometimes used metonymically to refer to the entire Canada-U.S. border. Actually, many of Canada's most populated regions (and about 72% of the population) are south of the 49th parallel, including the two largest cities Toronto (43°42′ north) and Montreal (45°30′ north), the federal capital Ottawa (45°25′ north) and the capitals of all provinces except the Prairie provinces (Alberta, Saskatchewan and Manitoba), these being the only provinces entirely north of the 49th parallel. The three Maritime provinces are each entirely south of the parallel, but the vast majority of Canadian territory lies north of it. The Northwest Angle is the only part of the contiguous 48 states that goes north of the 49th parallel. The Treaty of Paris called for the boundary between the US and British territory to pass through the most northwesterly point of Lake of the Woods, and this was retained even after an 1818 treaty set the boundary west of that point to follow the 49th parallel. ^ Lass, William E. Minnesota's Boundary with Canada: Its Evolution Since 1783. p. 28. Retrieved 8 February 2018. ^ "The true origin". Welcome to OS Net. Southampton: Ordnance Survey. 4 September 2007. Archived from the original on 5 December 2008. Retrieved 13 August 2009. Point Roberts is a pene-exclave of the United States on the southernmost tip of the Tsawwassen Peninsula, south of Vancouver, British Columbia, Canada. The area, which had a population of 1,314 at the 2010 census, is reached by land by traveling 25 mi (40 km) through Canada. It is a census-designated place (CDP) in Whatcom County, Washington with a post office, and a ZIP Code of 98281. Direct sea and air connections with the U.S. are available across Boundary Bay. The term "British North America" refers to the former territories of the British Empire in North America, not including the Caribbean. 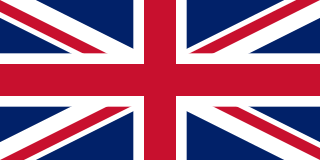 The term was first used informally in 1783, but it was uncommon before the Report on the Affairs of British North America (1839), called the Durham Report. These territories today form modern-day Canada and the Pacific Northwest of the United States. The Northwest Angle, known simply as the Angle by locals, and coextensive with Angle Township, is a part of northern Lake of the Woods County, Minnesota. Except for minor surveying errors, it is the only place in the United States outside Alaska that is north of the 49th parallel, which forms the border between the U.S. and Canada from the Northwest Angle westward to the Strait of Georgia. The land area of the Angle is separated from the rest of Minnesota by Lake of the Woods, but shares a land border with Canada. It is one of only six non-island locations in the 48 contiguous states that are practical exclaves of the U.S. It is the northernmost township in Minnesota and contains the northernmost point in the contiguous 48 states. The unincorporated community of Angle Inlet is located in the Northwest Angle. The Pembina Region, also referred to as the Pembina District and Pembina Department, is the historic name of an unorganized territory of land that was ceded to the United States. The area included parts of what became North Dakota and a portion of central eastern to northeastern South Dakota. 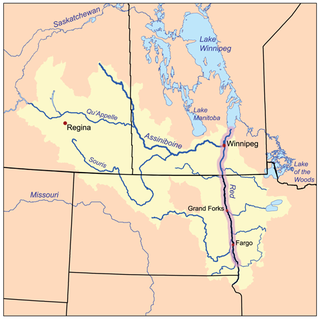 The eastern boundary was the Red River and included the Pembina River area. The region was formerly part of British Rupert's Land and the Red River Colony, that encompassed an area then known as the Assiniboia District, from 1763 to the signing of the Treaty of 1818. The treaty transferred the region that was south of the 49th parallel from the British to the United States. 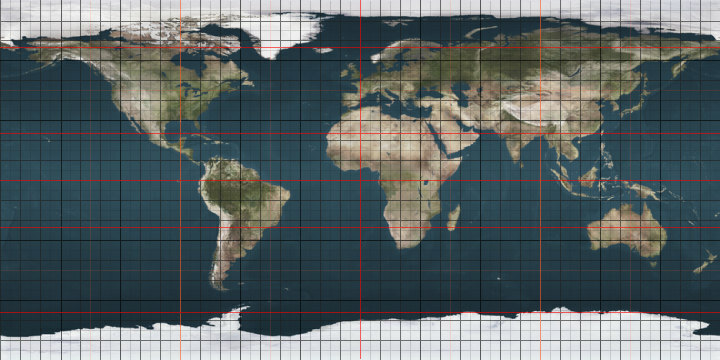 The 37th parallel north is a circle of latitude that is 37 degrees north of the Earth's equatorial plane. It crosses Europe, the Mediterranean Sea, Africa, Asia, the Pacific Ocean, North America, and the Atlantic Ocean. The northwesternmost point of the Lake of the Woods was a critical landmark for the boundary between U.S. territory and the British possessions to the north. This point was referred to in the Treaty of Paris in 1783 and in later treaties including the Treaty of 1818. This point lies at the corner of the Northwest Angle of Minnesota and is thus the northernmost point in the lower 48 United States. After Canadian Confederation, the point became the basis for the border between Manitoba and Ontario. The 1763 Treaty of Paris ended the major war known by Americans as the French and Indian War and by Canadians as the Seven Years' War / Guerre de Sept Ans, or by French-Canadians, La Guerre de la Conquête. It was signed by Great Britain, France and Spain, with Portugal in agreement. Preferring to keep Guadeloupe, France gave up Canada and all of its claims to territory east of the Mississippi River to Britain. With France out of North America this dramatically changed the European political scene on the continent. The Collins–Valentine line, or Valentine–Collins line, is the boundary at approximately 45 degrees north latitude that separates the province of Quebec from the states of New York and Vermont. It was surveyed and marked by survey monuments in 1771–3 by John Collins, surveyor-general of Quebec, and Thomas Valentine, a commissioner appointed by the government of New York.